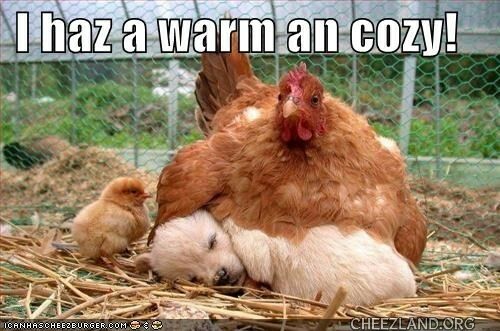 I haz a warm an cozy! We’re burds of a erm… furr??? Dat has to be wun confuszuled chikkin. Shur, HER footsiez ar warm. Bebehh is nawt happi, tho. Iz gonna sue puppeh fur alienatshun uf affekshuns! Frun teh luuk on teh chikkin’s fayce, I’d say she’ll be in hyooj trubblol wehn Misturr Roosurr gets hoam. Funneh, teh goggie duz nawt luuk liek teh milkman. Chook sez: Biggest egg ai ever had tu lay !! Teeny Chikee: Erm… *noks* Xkyooz me. Hallo, mawm? Plz tew haz mai spawt bak? In Cheezland, the time is 19:06.